Looking at the construction industry can give us a good idea of the state of the economy overall. Following on from last year, the main drivers in the construction industry seem to be the shortage of labor and the fairly stagnant domestic housing market. 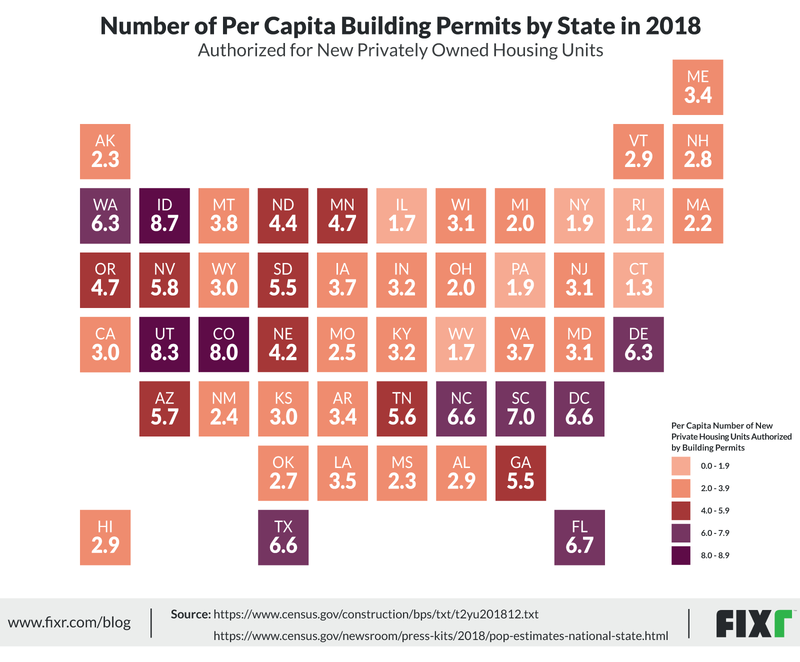 We look at the number of building permits authorized by state, comparing both totals and per capita rates, to assess growth across the country. 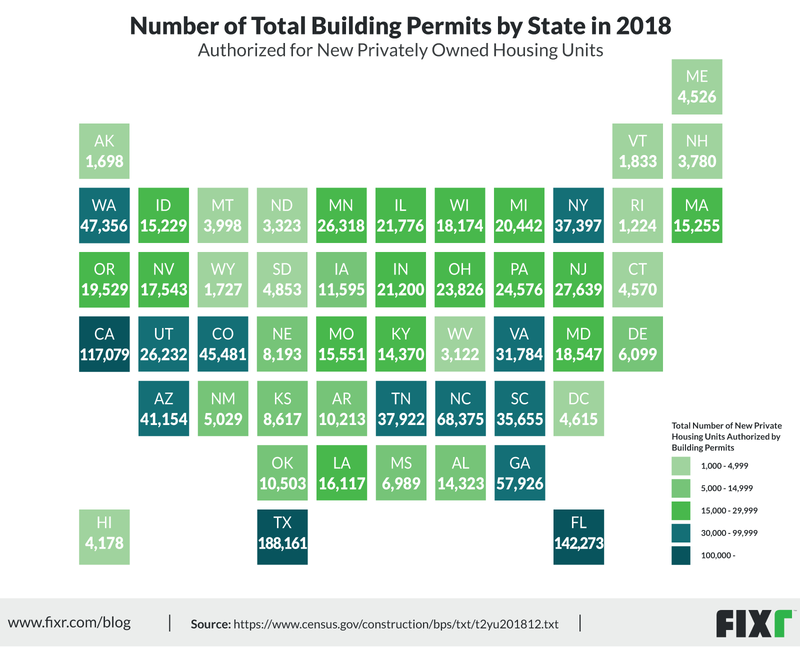 This graphic was created using information from the U.S. Census Bureau’s monthly report on the number of authorized building permits by state. It is broken down into the total number of units for the complete year of 2018. As was seen in 2017, the top ten spots are still held by the same states. Texas led the charge with 188,161 permits issued overall, Florida had 142,273 permits issued, and California had 117,079 permits issued. North Carolina (57,926), Georgia (57,926), Washington (47,356), Colorado (45,481), Arizona (41,154), Tennessee (37,922), and New York(37,397) followed. The next 10 spots all had more than 20,000 permits issued with South Carolina on 35,655, Virginia on 31,784, New Jersey on 27,639, Minnesota on 26,318, Utah on 26,232, Pennsylvania on 24,576, Ohio on 23,836, Illinois on 21,776, Indiana on 21,200 and Michigan on 20,442. 11 states fell between the 10,000 and 20,000 marks, namely, Oregon (19,529), Maryland (18,547), Wisconsin (18,174), Nevada (17,543), Louisiana (16,117), Missouri (15,551), Massachusetts (15,255), Idaho (15,229), Kentucky (14,370), Alabama (14,323), Iowa(11,595) and Oklahoma (10,503). The remaining eighteen states only filed for fewer than 1,000 permits in total and their combined total only equated to 41,6% of Texa’s total. The lowest three totals came from Wyoming (1,727), Alaska (1,698) and Rhode Island (1,224). 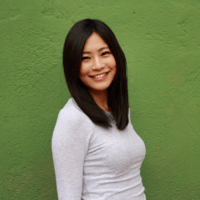 When we start to look at the per capita breakdown, however, the situation is fairly different. In this case, Idaho, Utah, and Colorado lead the pack with 8.7, 8.3, and 8.0 permits per 1,000 people. Texas was only 8th on the list with 6.6 permits per 1,000, Florida 5th and California only 32nd with 3.0 permits per 1,000. When we compare this to population sizes, we can start to get a better understanding of the situation. None of the top three states for permits per capita, come close to the top ten states for population level. Conversely, California is ranked as the most populated state and represents 12% of the population. Texas has the second highest population and Florida the third highest. Across the board, Single-family units saw the largest growth, with an increase of 5.7% from the year before, until October, when a decline was observed. Multifamily units only saw growth of 2.8%, with the main growth seen in 5-or-more occupancy units (high-density housing). The growth of single-family units was focused predominantly in the coastal states from California and the South-West, all the way round to Florida. The central and northern states, however, displayed an overall decline throughout the year, dropping by 1.6% in the midwest and 2.8% in the northeast. The highest growth rate of 21.1% was recorded by Colorado, while the biggest drop of 69% was recorded by District of Columbia. Multifamily growth was more scattered with the main focus falling to the eastern states. Rhode Island recorded the highest growth with 287 permits issued, compared to the 44 of the previous year. Delaware showed the greatest drop of 59.6% falling from 1,248 permits the prior year, to only 504 in 2018. Looking at the drivers for domestic construction growth, we need to look at demand and what the economy is doing to push demand upwards. One of the first drivers for demand is population growth, which has actually been at its lowest point since the 1930s. Considering most new housing is built for new demand (rather than to replace existing) this suggests demand will decrease in line with population, though at delayed rate. Another driver is household size. As the number of average members in a house decreases, demand goes up. E.g. 2 kids move out of a 4 person home, making their family home a 2 person occupancy and adding demand for 2 more homes, 1 for each kid. Also, certain states have booming industries, pushing incomes upwards along with the demand for quick, plentiful housing, to accommodate the newly employed. While single-family unit growth is still on an upward trend, the rate of growth has started to decline. Single-family units often reflect the state of the housing market and the construction industry, both of which have taken a hit in recent years. The domestic construction industry has seen a decline, thanks largely to the lack of skilled labor; while the housing market has slowed significantly thanks to a lack of inventory as well as increasing mortgage rates. High-density multifamily housing has increased in popularity, compared to duplexes and 3-4 occupancy units. Multifamily units respond more to population density, especially in larger cities where residents want to be close to amenities and services, but can’t afford the high single home prices. Though growth has been slowing overall, there is still a significant amount of demand for new builds across the country. By considering the areas that have shown positive growth, and assessing the population changes (increased employment opportunities, increased demand for affordable housing, etc.) it should be possible to assess what type of construction will be most suited to each state. The construction industry needs to remain focused to take advantage of the growing markets, especially as the future of this growth is not guaranteed. By taking the lead, professionals in the industry can ensure demand is met and the market continues to prosper.